Spike Lee says Obama was Savior/Black Jesus | Stop Obama Now!! 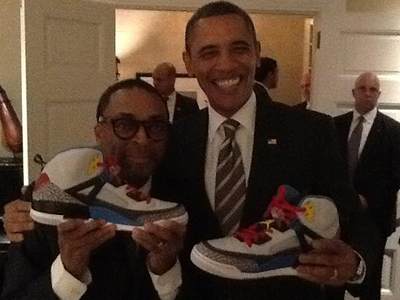 Spike Lee says that Obama was the “Savior” and a “Black Jesus”. It should be recognized that this idea of a black savior has existed as a cult idea for a very long time in the black community. Black Nationalism is an occult movement that has existed as a mass movement for nearly 100 years and several groups have worshiped their leaders or other men as the black messiah and divine beings. In general black nationalism cult doctrine is that the black race is God. It is a lot like the belief system of Charlie Manson, Jimmy Jones or David Koresh, all of whom saw themselves as the messiah and savior. The Nazis have a similar cult doctrine that the Aryan race is God. The Rastafarians are a branch of black nationalism and worship the former emperor of Ethiopia, Haile Salassie, as the black Christ. The Nation of Islam worships their founder, Fard Muhammad, as Allah in the flesh. Louis Farrakhan, the current head of the Nation of Islam has also said that he is God. Farrakhan declared Obama to be the black Messiah during the 2008 campaign. The Yahweh Nation cult worshiped their founder as God, Yahweh ben Yahweh. Yahweh ben Yahweh was convicted of conspiracy in the serial killing of about 15 random whites and dissidents. Malachi Z York declared himself to be God. He is currently in prison for molesting dozens of children of his cult members. The Black Liberation Theology of Obama’s Trinity church in Chicago was inspired by the Nation of Islam and teaches that the black race is the “manifestation of God on earth” and that messiahs will be self-exalted individuals from the black race. When Obama’s followers refer to him as the Savior, Messiah or God. This should be taken very seriously, because black nationalist doctrines teach that the black man is literally God and that the white race is the devil. It is extremely dangerous to have a president with this kind of cult religious background. This entry was posted in Black Cults, Farrakhan, Nation of Islam. Bookmark the permalink. This one article alone shows off your excellent writing skills. I am very impressed with your views and interesting content. I hope you intend to continue writing more informational articles.